I added a garbage can to the shop that is designed to prevent the “spontaneous combustion” of rags that have wet finish on them, etc. 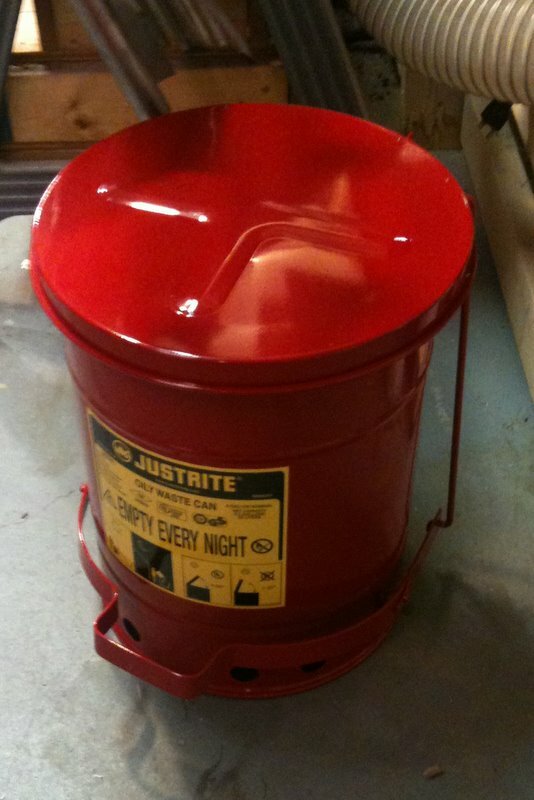 Now that my son, daughter and I are all doing projects in the shop, I’ve noticed that not everyone remembers to lay out their drying rags in a safe manner to prevent a surprise fire after we all leave the shop….I’m hoping the the big red can in a prominent location helps matters. $46 on Amazon. Posted on February 6, 2011, in Tools and Shop. Bookmark the permalink. 4 Comments. Thanks for the recommendation and link. Just ordered one… worth it for the peace of mind alone. No more second-guessing if I laid out oily rags right. That looks like a good find. I wonder whether this could also be used to store finishing products, spirits and other flammable liquids? In the UK at least, Health & Safety are very strict on this – any such liquids should NOT be stored in the workshop due to the fire risk… I wonder how they’d feel about a sealed unit like this.